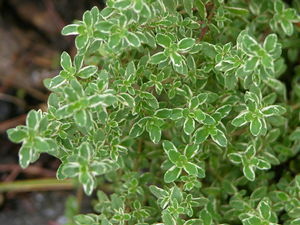 The variegated lemon scented foliage makes an attractive and aromatic addition to the herb garden, rock garden or container. Golden-edged green leaves offer lemon flavoring for culinary uses as well. Lavender-pink flowers in late spring to summer on 6-10” fragrant foliage.